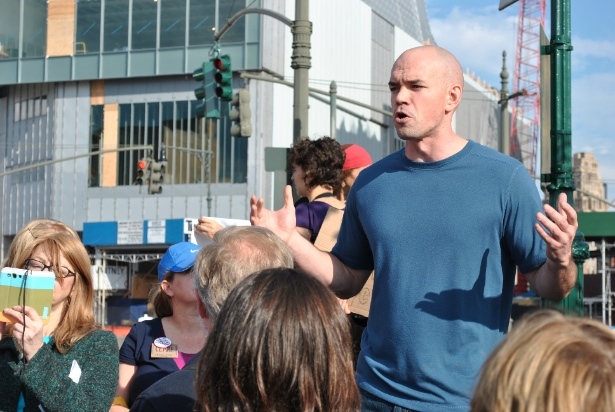 On his way to protest a natural gas pipeline into New York City, climate activist Tim DeChristopher discussed the interplay between local and global struggles against fossil fuel. If you walk along Manhattan’s West Side Highway, upon the long strip of bike lanes and greenery between the Hudson River and the droning automobiles, you’ll come to a fresh patch of pavement that’s a stone’s throw away from the Pier 51 Playground. You can’t tell by the look of it, but beneath the new asphalt hundreds of millions of cubic feet-worth of natural gas are flowing. 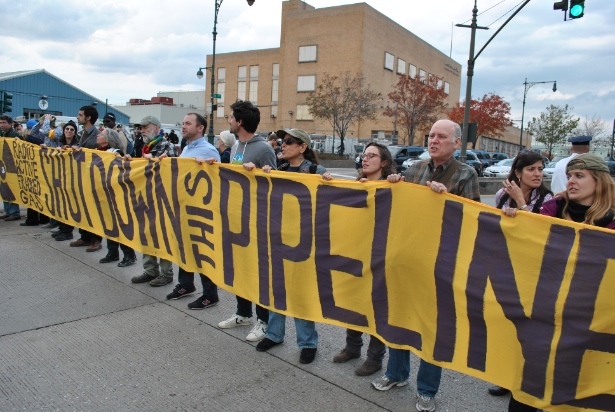 While the national climate movement has focused on the transnational Keystone XL pipeline, this tiny site has been the object of a more-than-two-year local battle over the first natural gas pipeline to enter New York City in 40 years. Objecting to the high radon content of the fracked gas and the risk of explosion this pipeline carries, my friends and I waged a campaign of legal challenges and protests against its operator, Spectra Energy Corporation. Despite our best efforts, however, the pipeline went live on Friday. The following day, we gathered for one last act of defiance, bringing all seven lanes of the West Side Highway to a standstill. “They built a pipeline, we built a movement,” said Clare Donahue, a Manhattanite who has dedicated the last three years of her life to stopping Spectra, as she and a dozen others were being arrested. The banner they had strewn across the highway read, “Shut down this pipeline.” But it may as well have read “Shut down all pipelines” because everyone there knew that this was just one battle in the greater war against fossil fuels. It just so happened that among those present was Tim DeChristopher, an environmental activist who came to notoriety in 2008 when he disrupted a Bureau of Land Management oil and gas lease auction in Utah. DeChristopher spent 21 months in jail after bidding on land to keep it out of the hands of drillers — a story that served as inspiration for many people working within the climate movement today. On my walk to the final Spectra pipeline protest, I spoke with DeChristopher about moving forward after a loss like this, and the larger struggle against fossil fuels. There’s a debate within the climate movement right now over whether too much focus is being placed on the Keystone XL pipeline at the expense of local struggles. How do struggles like this one against the Spectra pipeline relate to the larger struggle against fossil fuels? We don’t need to decrease the emphasis on the Keystone XL, but we need to increase the emphasis on all these local struggles. We’re at a point where every single fossil fuel development should be fought — every pipeline, every bit of infrastructure. We don’t have a national energy plan or a climate plan that seriously takes into consideration the impact of burning fossil fuels. There’s no pipeline under consideration that has had a true cost analysis, where corporations have said, “Based on a carbon tax that makes us pay for the full consequences of our actions, it’s worth it. We think it’s worth it for us to build this pipeline.” There’s no fossil fuel development project that’s in that situation. Until we have that national legislation, that national response to the climate crisis, every single fossil fuel development project should be fought. It should be fought in a way that acknowledges that lack of an overall climate response and puts pressure on the corporations that are standing in the way of that. The very same corporations that are pushing all these fossil fuel development projects are the same ones standing in the way of any coherent climate response. Their attitude is “We don’t have to worry about those things. Those are externalities.” But at the same time efforts to factor in those costs have been market-based. Carbon trading schemes have been wrought with fraud. Cap and trade was never a climate plan. Shell and DuPont wrote the cap and trade bill, and used the Sierra Club and World Wildlife Fund and everybody else involved in the U.S. Climate Action Partnership as a front group. Cap and trade was a corporate welfare bill. The way to put a price on carbon is with a carbon tax. Cap and trade was designed as a way to avoid carbon pricing. For moving forward and creating a truly sustainable economy, I object to the monetization of everything. That’s the current approach to externalities. That basically tries to put a value on human life. And commodify every molecule of water. Yes. I disagree with that, and I think there’s a better way to move forward with a truly sustainable economy. But when it comes to fossil fuels and fossil fuel development, the monetization of those externalities is enough. That monetization isn’t going to get us all the way to a sustainable economy, but it will be enough to kill fossil fuels. If they have to pay anywhere near the true costs they’re done. They’re off the table and renewable energy suddenly looks like the only option. It speaks to the necessity of a global movement. I’ve read criticism of carbon taxing that says if we tax carbon here, fossil fuel companies will simply look elsewhere. Are you concerned about that? No. If you look at any of the carbon tax plans that are on the table, they’re all taxed at the source in this country — at the wellhead, at the mine, or at the border as a tariff on fossil fuel or fossil fuel-intensive goods like concrete and steel. But if Shell wanted to keep extracting it could, for example, go to Azerbaijan. Production would increase elsewhere. Most of the plans out there would impose a tax on goods imported from any country that doesn’t have a carbon tax of its own that meets ours. What that would set up is a situation where if a country wanted to do business with the United States they could either not have a carbon tax and allow that carbon tax to be collected at our borders where it would go into our coffers or they could impose that tax themselves and it would go into their coffers. For any country that’s involved in global trade, where the United States by far is the biggest consumer, that’s going to be an easy decision for them. Yes, they could go and drill in Azerbaijan or wherever, but Azerbaijan is not burning that oil. They’re not the ones consuming it. It’s all mostly destined for Western markets. What about countries like Venezuela that are dependent on oil? That’s their curse, but also one of their bargaining chips against U.S. imperialism. Coming from a state [West Virginia] where we are told that we are dependent on coal for our economy, I firmly reject the notion that the only way to put food on the table is to condemn other people to an unlivable world. People have a lot more potential than that. Making sure that those people don’t have any other options is part of the economic model of fossil fuel development. Whether it’s in Venezuela or West Virginia, the only way they’re going to convince people to poison their water or blow-up their backyards is to make sure they have no other options. Keeping people oppressed with limited options is a core part of the fossil fuel economy. What, in your mind, are some of the underlying root social causes behind climate change? A big part of it is consumer culture — the idea that we should be meeting all of our human and emotional needs with the ever increasing consumption of material goods. If our opposition — the structure of institutions and governments — can be said to have a weapon, by and large their weapon is the tool of alienation. They use alienation to make people easier to exploit by isolating them from one another. Alienation breaks people’s spirits, it breaks apart communities and it breaks people apart from one another. When people are alienated from others they try to find their satisfaction in consuming more and more goods. Alienated consumers make better consumers. If they created a void that could actually be filled by material goods it wouldn’t be an effective strategy for very long. So the Spectra pipeline has been built now. There’s been a strong grassroots fight against it, but there’s gas going through it anyway. What do people do when movements lose a struggle? Fighting that struggle is always important, to let corporations and their pawns in government know that there will be a struggle with every one of these projects they want to push through and to make that a part of the cost of doing business. Until there is a carbon tax that accounts for the externality of climate change, we have to be the carbon tax and impose that cost of doing business on the fossil fuel industry. In addition, the energy from fighting this pipeline is being rolled into the energy needed to fight the Rockaway pipeline, to fight liquid natural gas ports, to fight fracking upstate. There has been a lot of great movement-building done as part of this effort. It has engaged people who might not have been paying attention except for the fact that this thing went through their neighborhood or by the playground where their kids play. Now these people can stand together to fight these impacts everywhere else. That’s what it will ultimately take: People going beyond just their backyard issues and standing as a united front against the fossil fuel industry. If people are only fighting battles in their backyard, they’re always going to lose those. If they don’t stand up in a bigger way, then they’re just waiting for their turn. That’s part of the reason why New Yorkers need to fight projects like this. Not only for the threats that they pose for local communities — radon and the risk of explosion — that directly impact them, but because New York, as a state, as of this point, has decided that fracking is not appropriate within its borders. There is still that moratorium, which hopefully will last. Yet, they’re using fracked gas from Pennsylvania. If that’s the position New York is taking, that it’s okay to frack in someone else’s backyard, but we don’t really want it here, then New York is just waiting for their turn to get fracked. If they’re not standing up to it when the gas industry is trying to feed them Pennsylvania’s gas, then when Pennsylvania runs out of gas they’re going to come after New York. That’s unless there’s a coordinated effort to stand up to the fossil fuel industry with every one of these battles. Suggested hashtag on Twitter: #IACT = I Am Carbon Tax!